Traveling 76 miles overall, Interstate 390 follows the Genesee Expressway north from the Southern Tier Region of Upstate New York to Rochester’s Outer Loop in the town of Brighton. The scenic freeway winds northwest from Avoca to Dansville, Geneseo and Avon through agricultural land and hilly terrain. North from the Finger Lakes area, I-390 continues to suburban areas of Monroe County, carrying commuters north from West Henrietta to the city of Rochester. The Genesee Expressway ends at the Outer Loop, having been canceled north from there to Downtown Rochester. 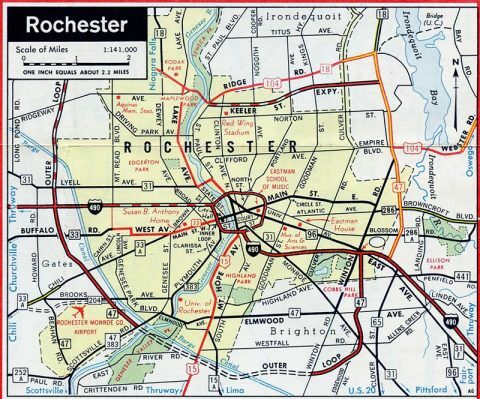 Interstate 390 follows the southwestern arc of the Outer Loop to Greater Rochester International Airport (ROC) and I-490 (Western Expressway) in the town of Gates. Interstate 590 lines the southeast quadrant of the Inner Loop, encircling Brighton northeast to I-490 in east Rochester. The Outer Loop extends north of I-490 on both sides of the city as New York 390 and 590 respectively. New York 390 travels 7.90 miles from I-390 and 490 to Lake Ontario State Parkway as a full freeway. 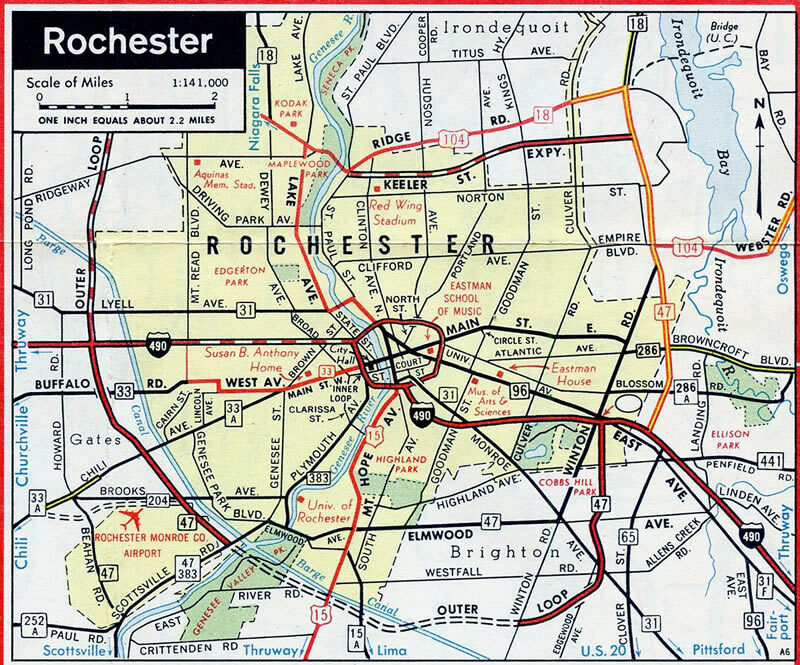 The Rochester Outer Loop posted as New York 47 in 1968. As construction progressed along both the Genesee Expressway and Outer Loop, the separate segments of state route freeway were incorporated into the Interstate system. Interstate 590 replaced New York 47 in Monroe County and New York 245 became part of Interstate 390 in Livingston County. The remainder of I-390 would see completion slowly over the course of 20 years. Some NYSDOT reference markers around Dansville still referenced NY 245 as of January 2017. Ultimately the Genesee Expressway project was dropped, with I-390 rerouted over the southwest leg of the Outer Loop in place of I-590. AASHTO approved the renumbering of Interstate 590 west from the Genesee Expressway on June 25, 1979. The action included designating the Outer Loop north to Lake Ontario State Parkway as part of Interstate 390. Despite that, the freeway north of I-490 remained signed as New York 390. Heading northwest from ROC Airport, Interstate 390 travels under a CSX Railroad, and to the east of the Dolomite Quarry, ahead of the ramps for I-490 (Exit 20A) east to Downtown Rochester and west (Exit 20B) toward Ogden and Spencerport. Photo taken 05/10/05. Interstate 490 (Western Expressway) bee lines east from I-390 through the Dutchtown neighborhood of Rochester to reach the Inner Loop Expressway in three miles. Photo taken 05/10/05. A left-hand off-ramp carries drivers onto Interstate 490 west for Brockport, Spencerport, and the New York Thruway to Buffalo. I-390 meanwhile transitions into New York 390, a freeway continuation northward to the Lake Ontario State Parkway near Crescent Beach. Photo taken 05/10/05. The sequential numbering system of I-390 extends northward to interchanges along the New York 390 portion. Pictured here is the southbound approach to I-490 at the New York 31 (Lyell Avenue) off-ramp (Exit 21). Lyell Avenue constitutes a commercial arterial east into the Lyell-Otis-Avery neighborhood of Rochester. Photo taken 05/10/05. Interstate 390 begins as New York 390 ends. Exit 20B leaves for I-490 west through Gates to Chili and Riga and the NY Thruway to Buffalo. NY 531 partitions with I-490 nearby as a freeway west to Ogden and Spencerport. Photo taken 05/10/05. An arrow per lane sign (APL) replaced this diagrammatic sign for the left-hand ramp (Exit 20A) to Interstate 490 east. Photo taken 05/10/05. Traveling west through a six-ramp parclo interchange (Exit 10) with Mt. Read Boulevard, drivers on I-490 west see the first set of signs for the back to back off-ramps for I-390 south and NY 390 north. Photo taken 01/18/17. Passing under the Rochester & Southern Railroad overpass, one half mile ahead of Exits 9B/A with the Rochester Outer Loop on Interstate 490 west. An auxiliary lane accompanies the freeway west from Mt. Read Boulevard to NY 390 north. Photo taken 01/18/17. A left-hand ramp veers southward to join Interstate 390 ahead of industrial areas of east Gates and Greater Rochester International Airport (ROC). I-490 remains west through Gates to the split with NY 531 (Spencerport Expressway) before turning southwest to Chili and Churchville. Photo taken 01/18/17. Construction during the Western Gateway Project slowed traffic along westbound I-490 leading to Interstate 390. Remaining button copy guide signs along the Western Expressway were replaced during the multi year project. Photo taken 05/10/05. Interstate 490 exits the city of Rochester for the town of Gates across the New York State Barge Canal. Ground level signs preceded the separation of traffic for I-390 south (Exit 9B) and NY 390 north (Exit 9A). Photo taken by Jeff Morrison 07/01/07. With the exception of a left-exit tab for Interstate 390 south, overheads on I-490 west at the Outer Loop were carbon copied by 2012. Photo taken 05/10/05. Advancing east from the merge with New York 531 (Spencerport Expressway), Interstate 490 east expands to three lanes to Exits 9A/B with the Rochester Outer Loop. This button copy guide sign for I-390 was replaced by 2011. Photo taken 05/10/05. The succeeding eastbound off-ramp joins New York 390 to North Gates, Greece and Lake Ontario State Parkway. The western half of the Outer Loop is a full freeway, while the eastern half is not, as the Sea Breeze Expressway portion was downgraded to a surface boulevard (Sea Breeze Drive). Photo taken 05/10/05. Exit 9A departs Interstate 490 eastbound for New York 390 north. Exit 9B follows for the Outer Loop southbound to Greater Rochester International Airport (ROC), west Brighton and the Genesee Expressway south to Henrietta. Photo taken 05/10/05. The roadways of Interstate 490 separate to accommodate left-hand ramps with the Outer Loop. Airport is the initial control point for I-390 south at Exit 9B. Corning is used at the exchange with Interstate 590. Photo taken 05/10/05. Interstate 390 concludes at Interstate 86 (Southern Tier Expressway) just to the southeast of Avoca in rural Steuben County. All guide signs for this junction were replaced by 2012. The new assemblies dropped both NY 15 and NY 17. Photo taken 01/18/17. An unnumbered ramp takes drivers headed for I-86 west to Hornell, Olean, Jamestown and Erie, Pennsylvania. Jamestown, a city of over 30,000 in Chautauqua County, lies 116 miles to the west. Photo taken 01/18/17. Interstate 390 south defaults onto I-86 (Southern Tier Expressway) east ahead of Bath. The rural freeway winds 24 miles along side the Cohocton River to Interstate 99 at Painted Post. Photo taken 01/18/17. A pair of end shields stand along side Interstate 390 south by the overpassing carrying I-86 (Southern Tier Expressway) westbound. New York 15 formerly overlapped with New York 17 east to Painted Post, where U.S. 15 begins south to Presho and Mansfield, Pennsylvania. Photo taken 01/18/17. Spanning New York 53 at Kanona, Interstate 86 advances 0.75 miles west to split with Interstate 390. Photo taken 07/01/05. The on-ramp from NY 53 forms an auxiliary lane west from Fivemile Creek to the separate of Interstates 86 and 390. The I-86 mainline exits with a single lane in a third of a mile. Photo taken 05/07/05. The rural route of Interstate 86 and the Southern Tier Expressway (NY 17) serves the small cities of Olean and Jamestown along its 153 mile course west to Interstate 90 in Pennsylvania. Olean, 66.3 miles away, lies at the west end of New York 417, which formerly carried New York 17 west from Erwins. Photo taken 05/07/05. Two lanes of I-86 west default onto Interstate 390 north for Rochester and Buffalo via the New York Thruway or U.S. 20. Dansville, a village of over 14,000, is 22 miles to the northwest. New York 15 formerly overlapped with the freeway north to Exit 3 outside Wayland. Photo taken 07/01/05. A 6.7 mile exit less stretch takes motorists along Interstate 86 (Southern Tier Expressway) east from Howard to the south end of Interstate 390 in the town of Avoca. Photo taken by Douglas Kerr (03/16/03). Unnumbered in the westbound direction, the off-ramp from I-86 east to I-390 north is Exit 36. The ramp makes a 180 degree movement to join the northbound freeway in what would otherwise be considered a a trumpet interchange. Photo taken by Douglas Kerr (03/16/03). Interstate 86 narrows to a single through lane as Exit 36 loops onto I-390 north toward Dansville, Geneseo and Avon. Photo taken by Douglas Kerr (03/16/03). Dansville History – Dansville Public Library. Interstate 390, New York Routes web site. The Genesee Expressway http://home.rochester.rr.com/kreativ/brian/genesee.htm, Brian Campbell. Page updated July 31, 2017.